Written by experienced AP® teachers; a complete tool to help students prepare for the AP® exam. 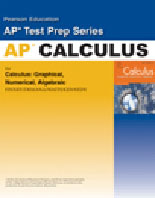 Text-specific correlations between key AP® test topics and Calculus: Graphical, Numerical, Algebraic, 3rd Edition, AP® Edition. Reinforces the important connections between what you teach, what students read in their textbook, and what your students will be tested on in May. Sample AB and BC exams including answers and explanations. Includes general strategies for approaching the examination day and specific test-taking strategies for addressing particular types of questions on the examination.